From barman at Manchester’s venue Band on the Wall, to acclaimed jazz performer, Sam Rapley has paid his dues. 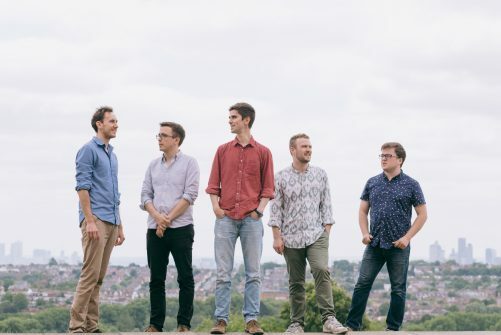 His band Fabled is now established on the vibrant London scene, after Rapley funded its debut album, Short Stories, with a Kickstarter campaign. Clarinettist, saxophonist and composer, he seeks to create narratives and cinematic forms through music. In childhood, how come you took piano lessons from jazz expert Robin Joiner? It was really a case of finding a local teacher, but Robin was then crucial in getting me into jazz. I started as a complete beginner with him, so it was only once I got more proficient that we played more jazz. He was encouraging and inspiring throughout our lessons and set me on the right path. You learned clarinet until your hands grew large enough to play sax. Did these growing pains make for a frustrating time? Yes, incredibly frustrating! As a child I’d been drawn to the saxophone because it was loud and cool and I heard it on Bryan Ferry’s track, Let’s Stick Together*. Eventually my time came to pick up a sax and I’m grateful for the foundation the clarinet gave me. I now perform on clarinet and bass clarinet almost as much as sax and love them equally. *(Chris Mercer: tenor sax solo; Mel Collins: soprano sax riff). Why did you leave Manchester for London? I got accepted at the Royal Academy of Music for their jazz course. I had an amazing jazz education in Manchester from Iain Dixon, Mike Walker and Les Chisnall, but wanted to study jazz at a conservatoire and Manchester didn’t offer that unfortunately. You seek a balance on Short Stories between improvisation and composition. Can you explain this process to non-musicians? It’s about expressing myself as a composer by writing specific parts, thus determining the shape of the music. But at the same time allowing these amazing musicians to have creative input by bringing a level of spontaneity. In Fabled, we’ve found different ways of doing this, rather than the standard jazz format of playing the tune and then everyone improvising. Improvs are often incorporated within chunks of composed music, so at times some people can be improvising whilst others play something written. Do you write basic outlines on the piano first? Yes, most of these tunes start on piano and get orchestrated out to the different instruments. With the music on this album I’ve been influenced by classical stuff, in particular impressionism, with regards to arranging the tunes. I wanted to experiment with combinations of instruments and find textures we’re not used to hearing from a jazz quintet. Is there a visual narrative in your mind when composing? Generally the idea is to create a narrative unique to each listener, whether visual or abstract. I don’t have such a visual brain in that sense, so when I’m writing music or listening to it, I’m not seeing a story unfold or picturing anything particular. It’s been interesting getting audience feedback and finding how people perceive the tunes. One of your side projects is ‘world jazz’ ensemble Waaju. Does your soloing respond differently to the global rhythms of this group? In some ways it’s a different approach to improvising, but there’s a common thread of creating a shape to the solo and interacting with other musicians. Having a clear sense of arc is something I always strive for whenever I improvise; it was instilled in me from the teachers I mentioned earlier. With Fabled, our music ebbs and flows in a more obvious way. People aren’t playing repetitive parts that loop round every two bars; they have a basic structure, but no two bars sound the same and this creates a more fluid interaction. With Waaju, the music is more repetitive and each instrument has a defined part, so there’s regular patterns I can play off and interact with. Another project you perform with is Patchwork Jazz Orchestra. Is their ‘big band’ format likely to find popular favour again? Who knows? Hopefully! The gigs we’ve done have been well received and there’s something viscerally exciting about seventeen musicians playing at once. It’s the same buzz you get from hearing a symphony orchestra performing Mahler; that epic-ness from large ensembles is a real thrill. Which novels would you like to write the film soundtracks for? I’m a big fan of Arundhati Roy’s book, The God of Small Things. She’s recently published The Ministry of Utmost Happiness, which I equally loved. The Vegetarian by Han Kang is weird and wonderful and would make a great film. Stoner by John Williams, Less Than Zero by Bret Easton Ellis, The Buddha of Suburbia by Hanif Kureishi – I could go on! You once worked as a barman at Band on the Wall. Care to divulge any secrets from the experience?